Process sensors are often installed using traditional sanitary clamp type fittings. 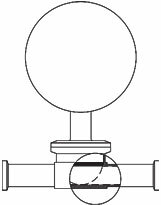 Even with “short outlet” or “instrument” tee’s, a pocket or deadleg is created between the flow path and the fitting face. With viscous products such as peanut butter, sauces, jam’s and jellies, etc. this pocket can build up or plug with product that cannot be effectively cleaned, with resulting sterility concerns. In pressure applications, it can also result in sensors that no longer perform effectively. Anderson has developed an in-line sanitary fitting, known as the CPM (Clean Process Measurement), which is widely used in the biopharmaceutical process market. The CPM fitting is a perfect solution to the above challenge for larger line sizes (up to 4”). It can be welded or clamped in place, completely eliminating the pockets and deadlegs associated with traditional clamp-type “T’s”. It is available as a single port fitting, but the most cost effective installation will include a dual port fitting with both a pressure and a temperature sensor installed. The dual port fitting eliminates the need for a separate “T” in many applications, thus reducing installation costs. Also, the ports are of universal size, so once a sensor or gauge is purchased with a mating CPM connection, it will fit into any CPM port, regardless of tubing size. This reduces spare parts inventory and the resulting carrying costs. So while the ultimate benefit has to do with food safety and peace-of-mind, the initial cost of upgrading to this solution is also offset by lower operating costs down the road.